5. AH-1400 1200-1600 MHz. 1.2-1.6 GHz 12 dBi. 7. AH-1800 1700 - 2000 MHz. 1.7 - 2.0 GHz. 12 dBic. 11. AH-2400 2200 - 2600 MHz. 2.2 - 2.6 GHz. 12 dBic. 30. AH-850 700 - 990 MHz 200 MHz. 12 dBic. 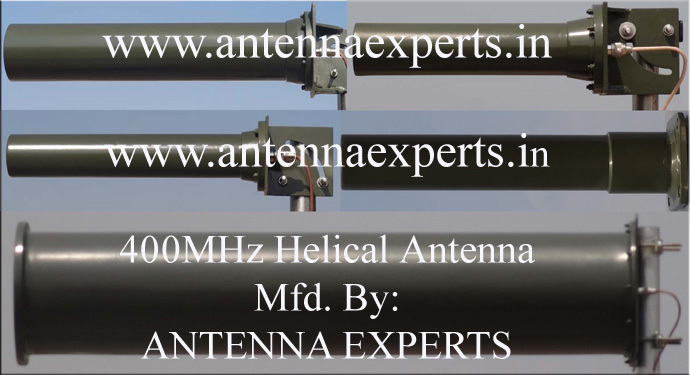 Antenna Experts manufactures helical antenna for 400MHz, 500MHz, 600MHz, 700MHz, 800/900MHz, GPS L1, GPS L2 band, 1450MHz, 1850MHz, 2.4 GHz, 2.7-3.3 GHz, 3.3 -3.8 GHz, 3.8-4.2GHz, 5.1-5.4 GHz, 5.1-5.9 GHz, 4.9-5.9 GHz. and 6-9 GHz frequency bands. Our circular polarized helical uses extended stubs to provide the greater gain while maintaining the excellent axial ratio and wider beam-width. These high-gain low-profile antennas use Circular Polarization Antenna Technology - which delivers better penetration through obstruction and interference. The AH-1117-9 and AH-1117-11 uses extended stubs to provide the greater gain while maintaining the wider beam-width and designed to provide wideband directional transmission/reception of radio signals from 1100-1700 MHz bands including GPS L1, GPS L2, GPS L5 and GPS L6 frequency bands. Our AH-5458 circular polarized helical antenna is 18dBic gain which is extreme high on this kind of antenna. AH-5458 uses extended stubs to provide the greater gain while maintaining the wider beam-width. This high-gain low-profile antennas use Circular Polarization Antenna Technology - which delivers better penetration through obstruction and interference. This commercial grade antenna provides superior performance as compare to significantly larger and more expensive products. AH-5458 circular polarized helical antenna available in both RHCP and LHCP polarization. These commercial grade antennas provides superior performance as compare to significantly larger and more expensive products. Also our AH series helical antennas are smaller than conventional yagi antenna. Cylindrical enclosure is used for low wind loading and for minimal effect of ice formation on the helical antenna operation as well as providing an aesthetically pleasing appearance. Helical antennas designed for signal reception from satellites. Helical Antenna Ideal for point-to-point communication over water or communication with the satellite where polarization changes dramatically which also helpful to minimize the effects of multipath interference. Our helical antennas are also highly suitable for UAV Ground Control Station application to provides communication link between Unmanned Aerial Vehicles and UAVs Ground Station. Our Right Hand Circular Polarized (RHCP) Helical antennas are highly suitable for frequency hopping or spread spectrum telemetry system over wide frequency range and a perfect choice for unmanned aircraft tracking system for UAV telemetry communication link at control center. Our AH series directional helical antennas are supplied with two-axis steering system (tracking mechanism to rotate the UAVs Ground Station Antennas manually in azimuth and elevation plane). A less complex but compact multi-sector antenna array provides intermediate range coverage for communicating with a UAV. This type of arrangement can be used for quick deployment and tactical applications. The AH-3842 SNG antenna uses extended stubs to provide the greater gain while maintaining the wider beam-width making it perfect for satellite news gathering application. This high-gain low-profile antennas use Circular Polarization Antenna Technology - which delivers better penetration through obstruction and interference. This commercial grade mobile SNG antenna provides superior performance as compare to significantly larger and more expensive products. Our AH series helical antennas are smaller than conventional yagi antenna. The SNG antenna is highly suitable for mobile satellite news gathering systems. The AH-3842 SNG Helical Antenna is supplied with a specially designed mounting arrangement for steering the antenna in both planes, over 360 Degrees in Azimuth and 90 Degrees in Elevation for terrestrial and satellite links. The AH-312 Helical Antenna is highly suitable for ground-to-air communications covering the entire UHF aeronautical band of 225-400MHz without the need of multiple antennas. The AH-405 circular polarized helical antenna is specially designed for Train Tunnel Communications which provides better penetration through obstruction and interference as compare to conventional yagi or panel antennas. Both, Right Hand Circular Polarized and Left Hand Circular Polarized Helical antenna can be supplied. For higher gain requirement, the Helical antenna can be supplied in DUAL stacked or QUAD stacked arrays. The above listed antennas are basic and generic models. Antenna Experts would be pleased to know more about your customized gain and frequency band. The AH-450 helical antenna is designed to cover the entire 430-475 MHz band with single antenna, eliminating the requirement of multiple antenna. Ah-450 helical antenna uses extended stubs to provide the greater gain while maintaining the wider beam-width. This high-gain low-profile antennas use Circular Polarization Antenna Technology - which delivers better penetration through obstruction and interference. The AH-1117-16 uses extended stubs to provide the greater gain while maintaining the wider beam-width and designed to provide wideband directional transmission/reception of radio signals from 1100-1700 MHz bands including GPS L1, GPS L2, L5, L6 bands with 16 dBic gain. The AH-1726-16 uses extended stubs to provide the greater gain while maintaining the wider beam-width. The extended range AH-1726-16 is designed to cover the entire 1700-2600 MHz. band with single antenna eliminating the requirement of multiple antenna having 16dBic gain. The extended range AH-1726-16 is designed to cover the entire 1700-2600 MHz. band with single antenna eliminating the requirement of multiple antenna having 16 dBic gain. The extended range AH-1726-16 helical antenna is supplied with a specially designed mounting arrangement for steering the antenna over 360 Degrees in Azimuth direction and 90 degrees in elevation. The extended range AH-850-15 utilizes circular polarization to minimize the effects of multipath interference having 15dBi gain. Both Right Hand Circular Polarized (RHCP) and Left Hand Circular Polarized (LHCP) helical antenna models are available. The extended range AH-850-15 Helical Antenna is light weight, broadband and rugged helical antennas, supplied with ABS radome to protect the antenna from environment.